The production of complex mechatronic assemblies as well as complete devices and systems is a core competence of JÜKE. As an OEM supplier, we manufacture in a wide range – from prototype and custom-made products through small series to medium-sized series. A highly qualified team and our modern infrastructure, for example in the field of CNC machining technology, ensure reliably high productivity. 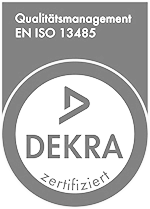 We cover the quality of our production and the fulfillment of the requirements according to ISO 13485 and ISO 9001 by means of a modern ERP system, specially developed test tools and testing devices as well as a high-performance logistics management. The combination of holistic system development with production under one roof releases synergy effects that promote quality and success. We have a high-quality machinery for in-house production on our disposal – CNC machining technology, as well as precise laser welding and marking. In cooperation with long-standing external specialists, we also offer sheet metal working, grinding technology, thermal treatment and surface refinement. IDEA AND MANUFACTURE FROM ONE SOURCE. Our production solutions precisely fulfill the specifications and demands of our customers.